A small native perennial with attractive pale mauve flowers Thysanoyus multiflorus gets the name ‘Fringe lily’ from the fimbriated or fringed petals on the flowers. 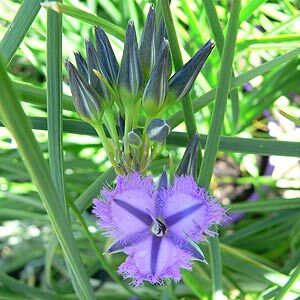 Flowers are violet blue color and very showy contrasting against the deeper green foliage. The fringed petals create an interesting softness to the flower especially in early morning and evening light. This is one plant from western Australia that seems at home in the Eastern states. This is grass like perennial however it is grown for the flowers rather than the foliage in most landscaping schemes. Excellent when planted in a rock garden as part of a mixed planting, also suited to growing in containers where the attractive flowers put on a good display. Can be used in a mixed border or as part of a cottage garden planting. Low growing to around 20cm and flowering in spring, it is a plant best suited to temperate climates. Flowering in spring this is a useful addition to any Australian Native plants landscaping project in the temperate zones.